If I had been a parent in Stockholm back then, I would have taken my kids down to the harbor to see the big event of August 10, 1628. As a parent, though, I’m not sure how I would have explained to my kids what actually happened that day. The Vasa had been commissioned by King Gustav II Adolph of Sweden to be a mighty war machine of a ship with not one but two gun decks and a high-above-the-water profile. Presumably the heavily-decorated hull was intended to inspire awe among allies, and to intimidate enemies. It had been under construction for a couple of years, and the king was eager to rush it into service. The Vasa had been moved from the shipyard and anchored at a dock directly below the Royal Palace. After all of the ceremonial blah-blah that day, it was finally time for the ship to take its maiden voyage. For the occasion, the crew was allowed to bring their wives and children aboard. A band probably played; thousands cheered and waved from shore. Dock workers used cables to tow the ship to the place where the current would then take Vasa east. They finally released her, the crew set four sails… and within minutes, a gust of wind pushed the ship over onto its port side. Water gushed in through the gun ports and the ship began to sink, right there in Stockholm Harbor. People on deck were hurled into the water, while others clung desperately to the masts. There was a lot of confusion and panic, as you might imagine, but since there was a substantial spectator fleet of small boats surrounding Vasa, most of its crew and guests were saved. The exact number who lost their lives is not known for certain, but is believed to be about thirty. A subsequent inquest confirmed what several of the king’s subordinates had privately feared: The “improvements” to the ship’s design, insisted on by the king, had made it dangerously top-heavy. The ship remained at the bottom of the harbor, taking on mud for centuries. Stockholm residents and their children crowded around the site as crews successfully brought Vasa back to the surface on April 24, 1961 — it was a much happier outcome than what had transpired there 333 years earlier. The ship was in good condition, considering that it had been underwater for three centuries, but painstaking restoration began immediately and is still going on. 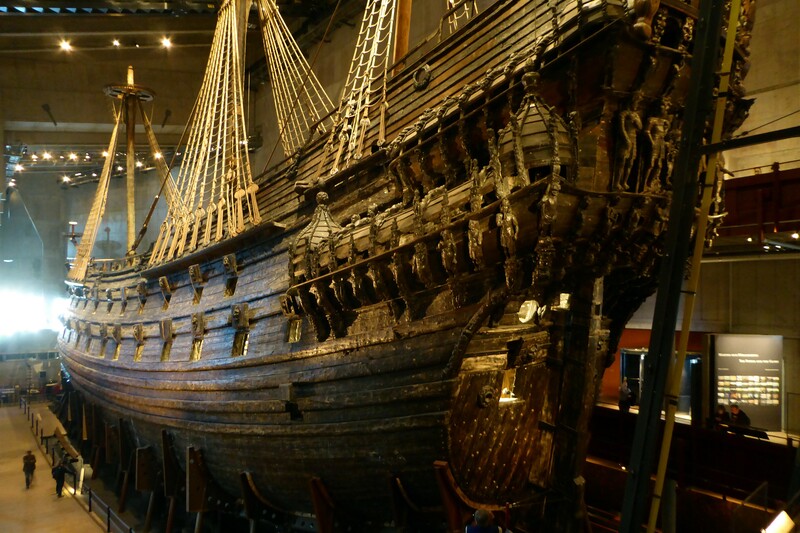 The Vasa is now the centerpiece of a museum that has been built around it. There are wonderful exhibits in the museum: facial reconstructions of some of the victims, based on skeletal remains, a meticulous 1:10 scale model of Vasa adorned as it was in 1628, cannons and tools that demonstrate how war at sea was waged back then. There’s also an exhibit called “Life at Sea”, which in the case of Vasa is sort of hypothetical. No one lived aboard her; the ship had traveled less than a mile of horizontal distance before it headed straight down.